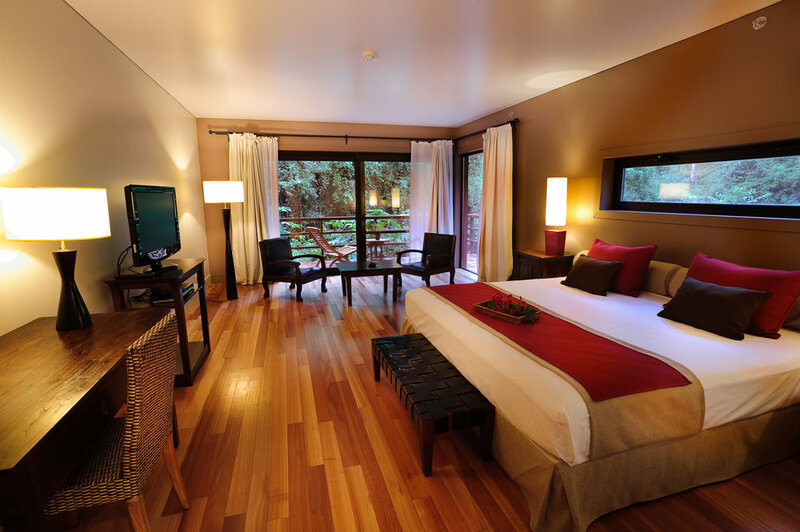 On arrival in Iguassu Falls, transfer to your hotel for your 2-night stay with breakfast included. We recommend arriving by early afternoon to allow the afternoon visit of the Brazilian side of the Falls. Alternatively, we can arrange a full day tour the following day to include both sides of the Falls. From the Brazilian side you will be able to enjoy the panoramic view of the falls only seen from here. It is a 1½ km walk which runs part of the way down the cliff near the rim of the falls, giving a stupendous view of the whole Argentine side of the Falls. There are walkways along the banks which take you almost under the powerful Floriano Falls. From here an elevator carries visitors to the top of the Floriano Falls and to a path leading to Puerto Canoas. There are also smaller access paths for those who prefer to walk. This whole area is now a Unesco World Heritage Site and the incredible humidity generated by the falls creates the perfect environment in which the lush vegetation and fauna thrive in this subtropical rainforest. A fascinating tour of the Argentine side of the Falls along the lower and upper paths takes in a closer view of this breath-taking marvel.At the entrance to the park the group will divide into smaller groups to visit the park.Guests walk down the well-maintained paths with stops at selected points along the way where the guides will be able to explain about the Falls and the eco-system of the area.There will be plenty of opportunities to take photos.At all times guests can enjoy different views and aspects of the Falls and the amazing views across to the Brazilian side.This tour is entirely on foot and is suitable for all levels of walkers. Iguazu Falls are in fact divided into separate waterfalls by a number of different islands. One of the most spectacular is Devil’s Throat. As part of the tour of the Argentine side of the falls, youwill board the small train which runs to Devil's Throat Station where there is a suspended walkway with spectacular views. * Approximately 4 hrs of walking + 01 hour for lunch (lunch not included) + train journey to Devil’s throat (25mins by train from central station to devil’s throat, approximately 15mins at devil’s throat, then 25 mins back to central station by train). After breakfast, private transfer to the airport for your onward flight. Accommodation in the above-mentioned hotels with breakfast daily. Airport transfers and tours in private basis withEnglish-speaking guides. Gratuities in hotels, restaurants and for guides and drivers. Other meals or services not mentioned in the itinerary.